“Seducing Doctor Lewis” (aka 'Le Grande Seduction') is one of the highest grossing Canadian films of all time. In 2003, it took in almost $9million, in the province of Quebec alone. It barely made a dent in English Canada, but it did manage to garner acclaim at the 2004 Sundance Film Festival and win the World Audience Prize. And for good reason, it’s a comedy set in a small Quebec town about the quirky citizen who host a big city doctor and try to convince him to stay in their village. In the tradition of small-town cultural films “Waking Ned Devine”, “Local Hero”, "The Full Monty" it’s light but highly enjoyable, gut-busting in some parts and a perfect film for its genre. The once thriving fishing community of St. Marie-La-Mauderne has come upon hard times. The residents who number only 120 people are forced to make a living off of their monthly welfare cheques. Despite these depressing times the townsfolks are surprisingly optimistic. The one glimmer of hope is a bid to locate a plastic manufacturing plant in the town. The main obstacle is that, for insurance purposes, the town must have a doctor residing, which, considering the remoteness of the community, is highly unlikely. Local community leader Germain Lesage (Raymond Bouchard) assembles the townsfolk to coax a young big city doctor Christopher Lewis (David Boutin) that St. Marie-La-Mauderne is the next best thing to heaven. And so begins the ‘grand seduction’ of Dr. Lewis. The town go to great lengths to adapt the town to Lewis’ every interest, desire and idiosyncrasy. From learning to play cricket to tapping his phones to tapping the depths of psychological reports the villagers reinvent themselves and find a new joie-de-vivre in their grand scam. With one part French Amelie-like fancy, one part British working class awk-shucks-ness and two parts Hollywood formula, the narrative moves and sways like a well-oiled machine. The cast is filled with so many lovable characters – Lesage is gruff and ethically-challenged but he’s so passionate about bettering his town he is the ideal flawed hero. His supporting conspirators include the local bow-tie wearing banker (Benoit Briere) who thinks he’s a big shot but is a hair-breath away from being replaced by an ATM, and the local wives who go about their wiretapping with Gestapo-like intensity. 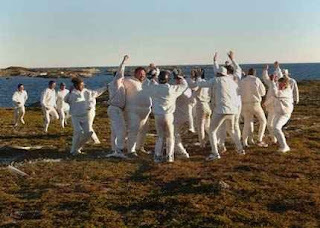 Several scenes stand out, including the ridiculous yet sublime cricket scene, where the locals learn cricket to impress the Lewis who has a love for the sport. From the water-view below the hill, the game looks authentic to Lewis, but the close-ups of their white sweaters and painted and refashioned hockey equipment is a gut-busting scene. The film mixes some comedy of errors, physical comedy, and clever fancifulness adding up to a near-perfect whimsical farce. Don’t take it seriously or over-analyze it. And to those English Canadians out there who never saw it or were to cynical to like it, shame on you. Just read the glowing reviews from the various countries around the world where the film was deservedly were distributed and lovingly embraced.